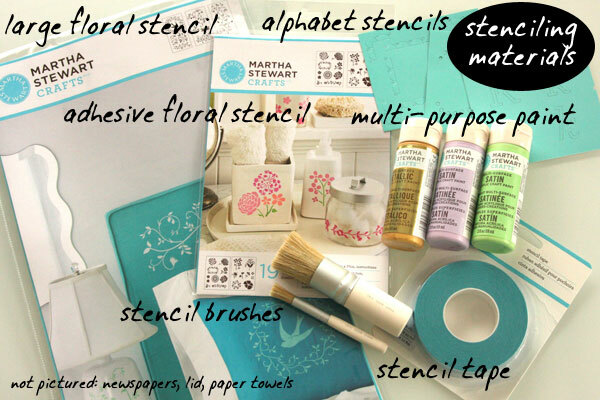 In March I was thrilled to find out I had been selected to participate in the PLAID and Martha Stewart Crafts Mother’s Day Campaign…and would be receiving a GIANT box of crafting supplies to make a DIY gift for Mother’s Day! I shared an unboxing video of all the generous items sent to me here, and like a giddy kid in a candy store began brainstorming ideas to make something wonderful, beautiful, and special with all my loot. Then, a week after I received all the supplies, my mother had a stroke and was hospitalized. I was in shock for some time. It was difficult to get a handle on the situation, as my mother lives alone and far away (Tokyo, Japan, to be precise). Though it was a mild stroke (a rare spinal stroke, actually), she lost feeling in both legs and was unable to walk. Her doctor would not release her until she was going somewhere where someone could be with her 24/7 and prevent falls, support her, take care of her meals and errands, and take her to her physical therapy appointments, etc. So I packed a suitcase and hopped on a plane to Tokyo 4 days later. I couldn’t bring most of the wonderful crafty items sent to me; the pressurized cans couldn’t be taken on a plane of course; and what I could fit still put my suitcase overweight. I didn’t know if I would have time or the mental ability to even put together anything craft-related while I was there, but I was determined to at least try since I’d received so much, and I’d committed to contributing. 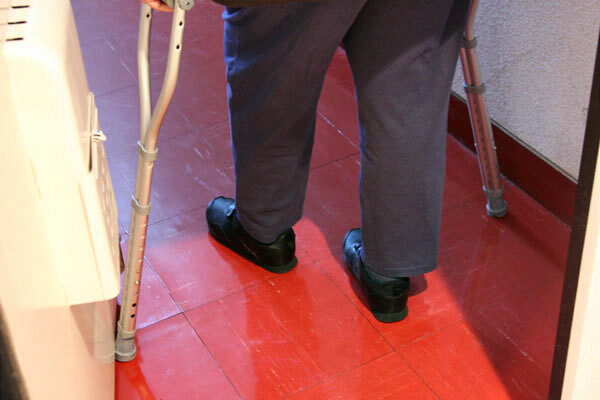 Once in Tokyo I found that my mother was able to walk a bit on crutches due to the physical therapy she’d had daily in the hospital, and she would be continuing outpatient PT twice a week, as well as weekly doctor’s visits and blood tests. I discharged her and then came to stay with her in her apartment. Over the past couple weeks she has been working at strengthening her legs, and is even beginning to walk a few steps without crutches. But once I have to go back to the States (early May), she will have to take care of herself, and grocery shopping (or any shopping really) is going to be very difficult on crutches with weak legs and difficulty balancing. 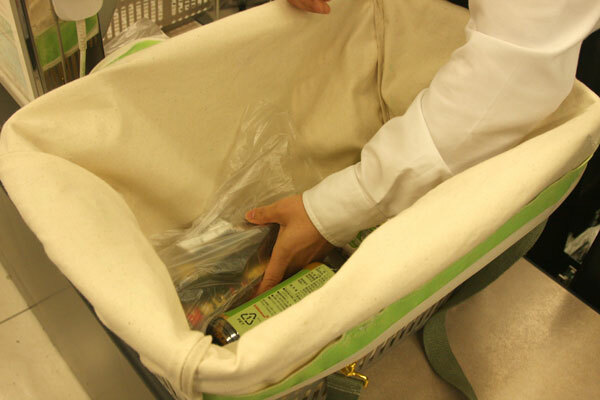 Here in Japan you use shopping baskets at the grocery store; the carts they have are just little wheeled frames that you load the baskets onto. 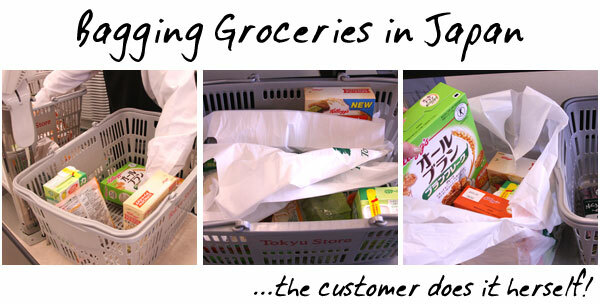 Then at the checkout stand the cashier scans each item and places it into a new basket, giving you some plastic bags. You take the basket to another counter and then proceed to bag all your items, then return the basket. Baggers don’t exist here, and nobody is there to “help you out” of the store or anything. This would be an impossible task to accomplish while on crutches. 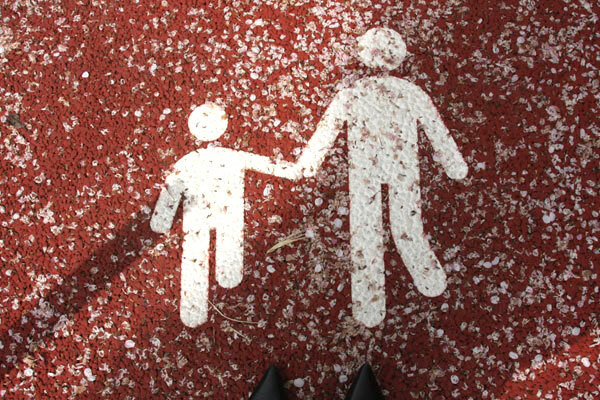 So I began to think of something that might be able to help my mother while she is still limited in mobility. 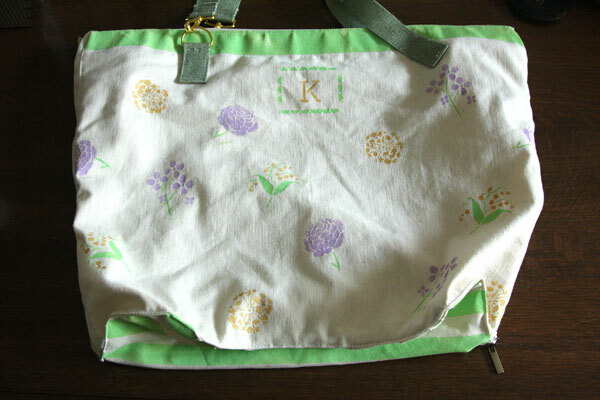 Then, the person at the register would zip up the bag – and here’s the great part – my mother could then put it on like a backpack. This would ensure she would not be unbalanced and would still have both arms free for the crutches. And then, when she gets stronger, she can just use it as a shoulder tote. The elastic sides get tucked into the bag and the long zipper goes all the way around the top to secure everything and make the bag compact. (Great for folding flat for storage!) And the straps unhook too! Perhaps this is something that might be useful for you too? Well, here’s how to make it! Note: Since most of my supplied I bought in Japan, my fabric and notion measurements were all originally in centimeters, so the inches I’ve provided as measurements are approximate. 1. This project requires just about 1 yard of 54″-wide fabric. From this fabric cut TWO rectangles 22″ wide by 18″ tall, TWO triangles 15.5″ wide by 18″ tall, and ONE small rectangle 14.75″ wide by 9″ tall. 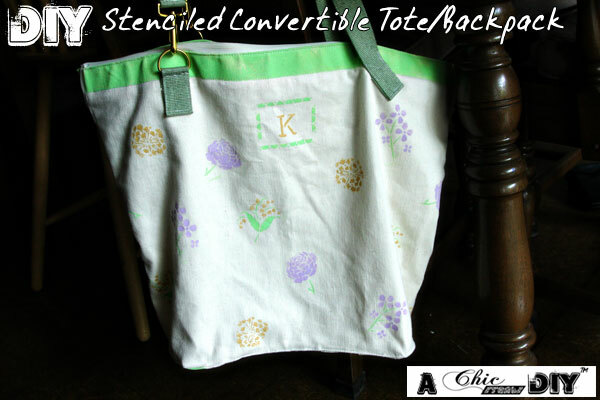 Include selvedges in your measurements since they will act as finished, bound edges on the inside of the bag. See cutting diagram above. 2. 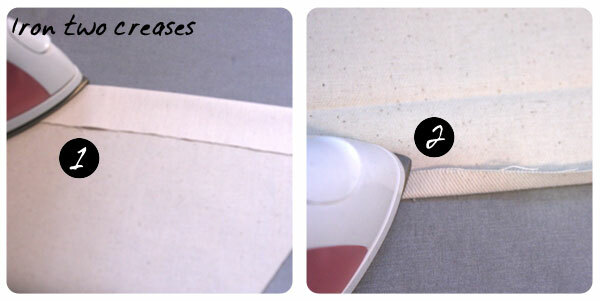 Use an iron to crease the top edges of both MAIN rectangle pieces and the SIDE GUSSET triangle pieces. 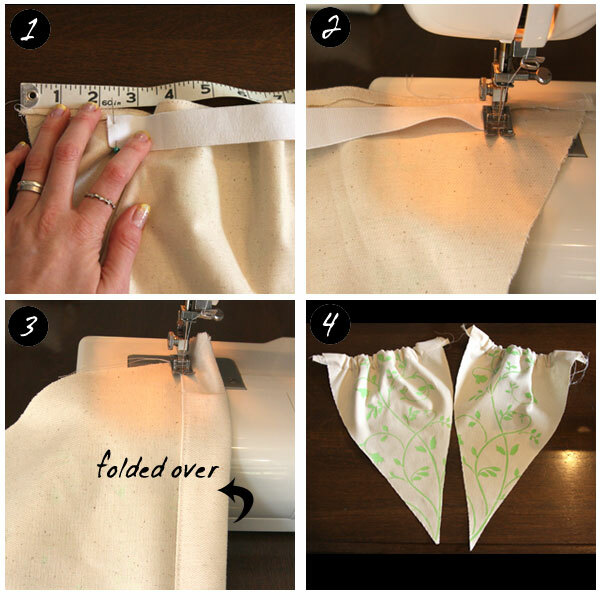 Fold 1.75″ from the top edge down and iron; then fold the top 1/2″ down and iron. These will eventually be a good guide when it comes time to sew. 1. Protect your work surface with old newspapers or junk mail. 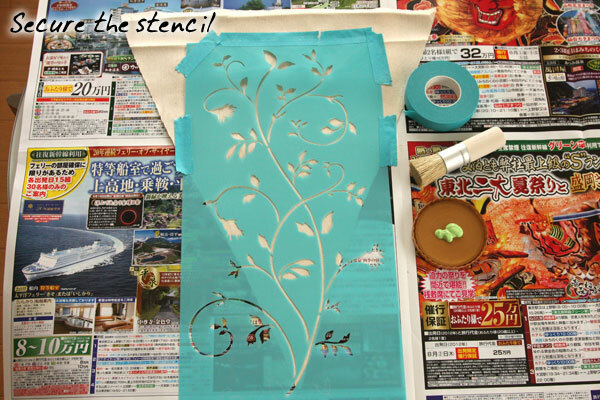 For the SIDE GUSSETS, I used the large-sized floral vine stencil, taping the edges with stencil tape to secure. 2. I then poured a small amount of paint into an old plastic lid, swirled my stencil brush in it, dabbed off the excess, and firmly tapped the paint onto my stencil. 3. Continue until you’ve filled the entire stencil with paint. 4. 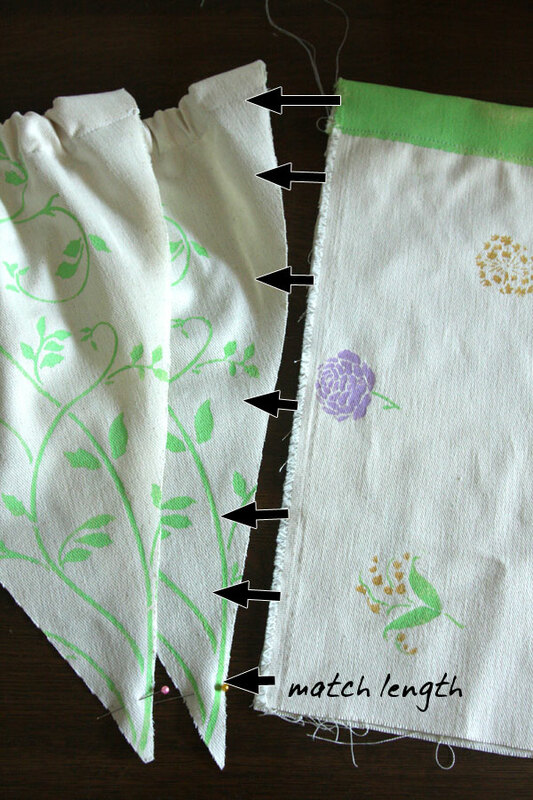 While the paint is still wet, peel off the stencil and tape, and use it for the other SIDE GUSSET piece. 5. 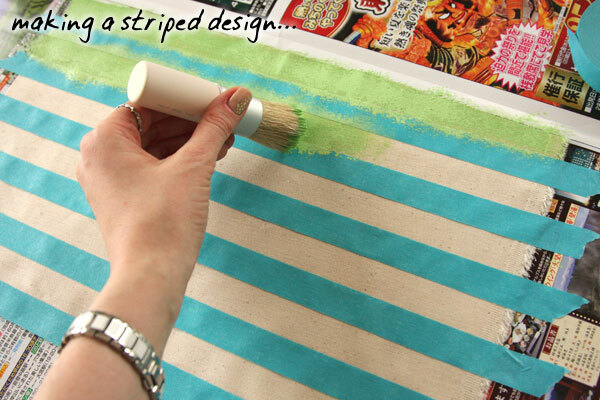 For the BOTTOM small rectangle piece, I used stencil tape to create stripes, and dabbed the paint on. I then peeled off the stencil tape and let dry. 6. 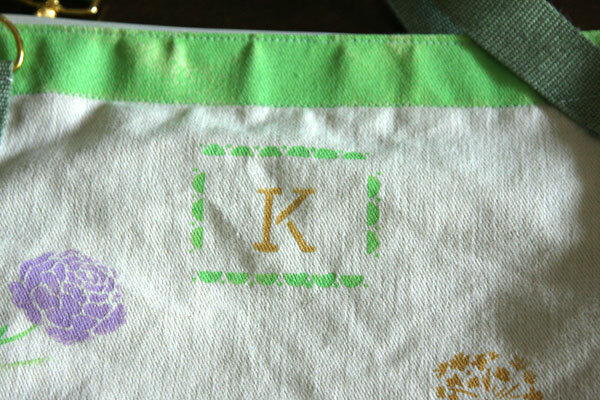 For the MAIN pieces, I used stencil tape to create a colored border at the top of each piece, then used my mother’s initial and a scallop border stencil from the Alphabet Stencils set to create a monogram, and then finished up with some flowers from the Adhesive Floral Stencil set. 7. 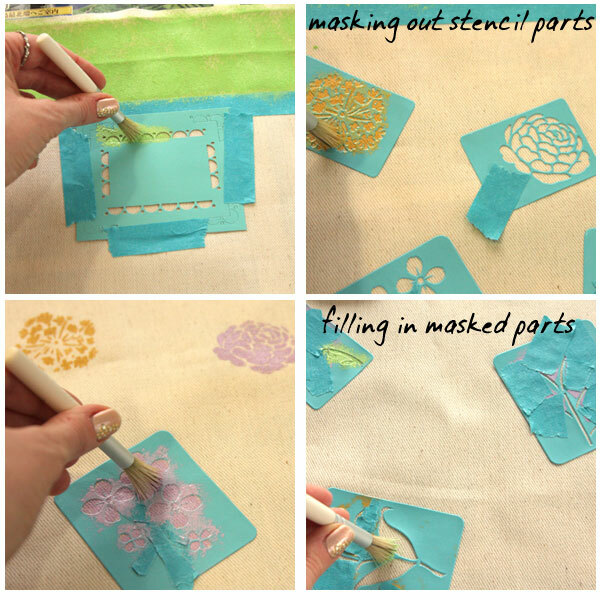 To do a bi-color stencil, you just have to mask off the parts of the stencil you don’t want to use with stencil tape and then dab color #1 on; peel off the stencil, remove the tape, and put tape over the part of the stencil you just used. 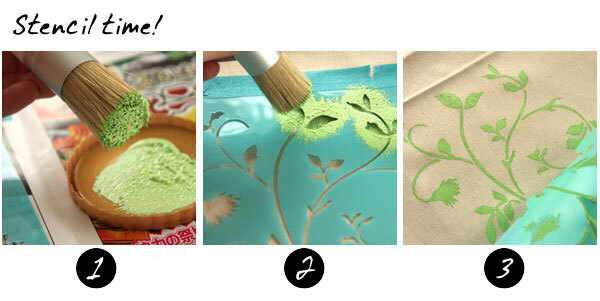 Then place the stencil back on the area you just did, aligning it with the stenciled pattern, and dab on color #2. 8. Allow all the pieces to dry. 1. 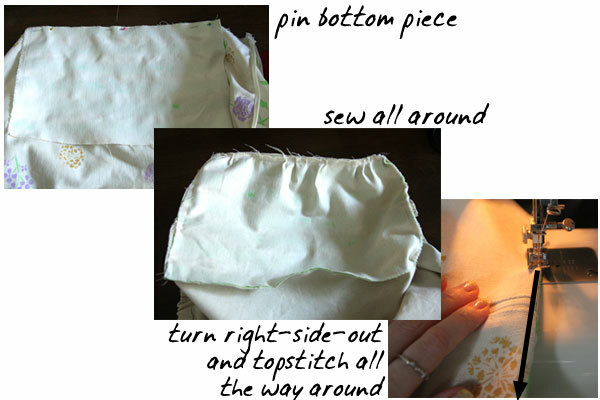 PREP YOUR PARTS: Fold the 1/2″ down from the top edge that you creased back in PART 1/Step 2 for the MAIN pieces, and topstitch down. 2. 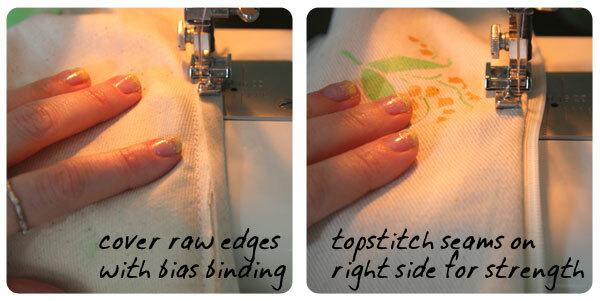 Fold at the lower crease mark (1.75″ from the edge that you also ironed earlier), and topstitch. Now you have two finished Main Bag pieces. 3. 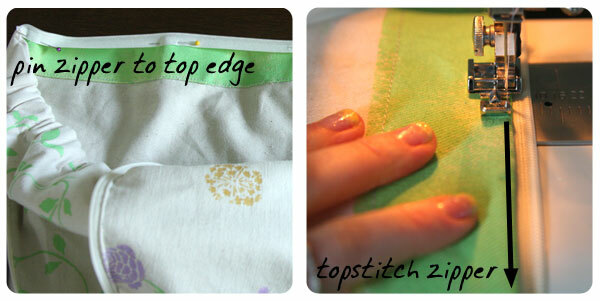 Fold the 1/2″ down from the top edge that you ironed earlier on both SIDE GUSSETS, and topstitch down. 4. 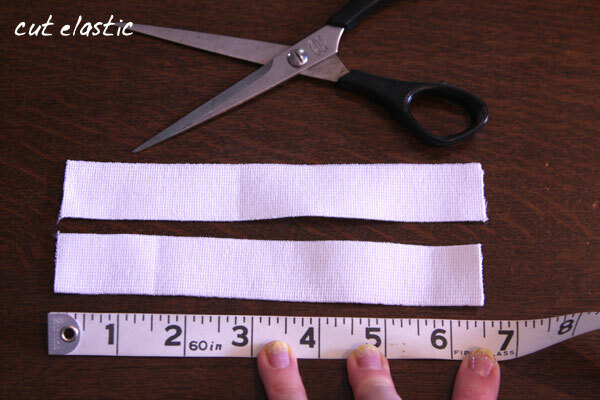 Cut the elastic into TWO pieces 6.5″ long. Pin the side of each piece about 2.25″ in from the side of each SIDE GUSSET, keeping the elastic above the remaining creasemarks. 5. Stitch vertically down the sides of the elastic pieces to secure, going back and forth a couple times. 6. 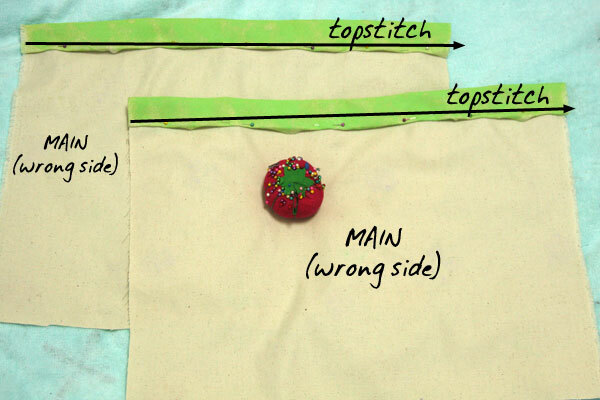 Fold the tops of the SIDE GUSSETS down at the creasemarks, and topstitch, stretching the elastic as you go. 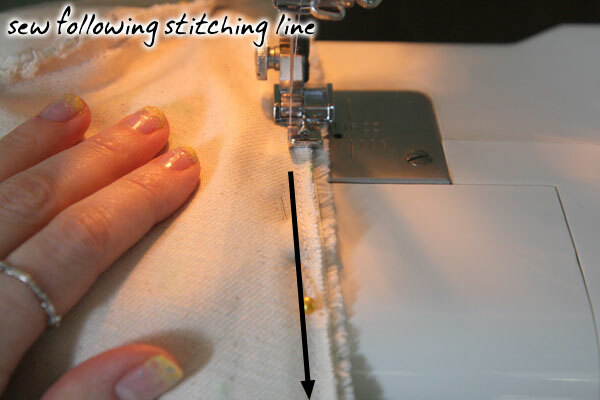 You should not be sewing through the elastic at all for this line of stitching. Now you have two completed elasticized gussets. 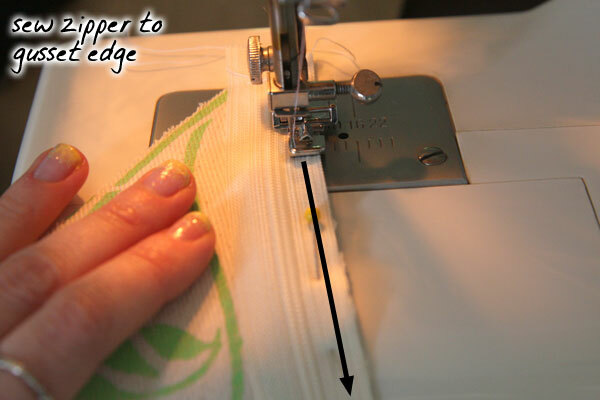 Trim off any excess fabric from the underside at the edges. 8. ATTACH THE ZIPPER TO THE SIDE GUSSETS: Line up the top of each gusset with the top of your MAIN pieces, and mark where the bottom of the MAIN pieces come to on your gussets with a pin. Lay the shortened zipper on top of one of the side gussets, matching up the top stops of the zipper with the pin you placed near the bottom of the gusset. 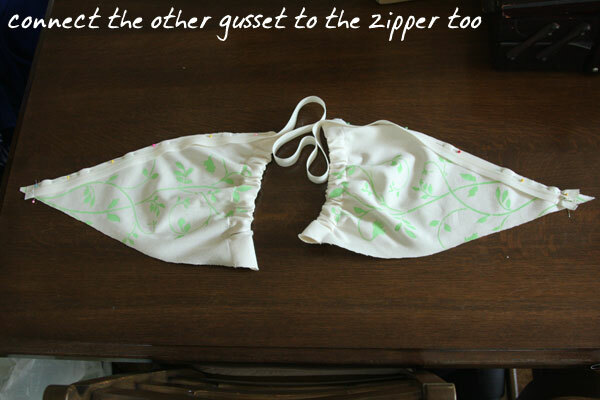 You’ll be laying the zipper right side on top of the left side of the gusset, lining up the edges. Pin. 9. Pin the other gusset to the other end of the zipper, this time matching up the zipper’s bar-tack (or bottom stop) with the pin you placed near the bottom of the gusset. 10. 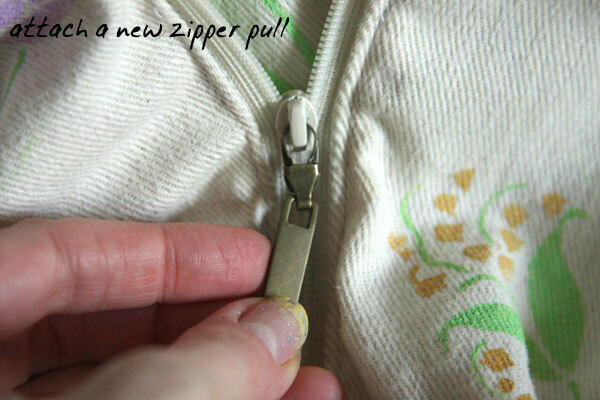 Sew the zipper tape to the side of each gusset, using a zipper foot if necessary. 11. 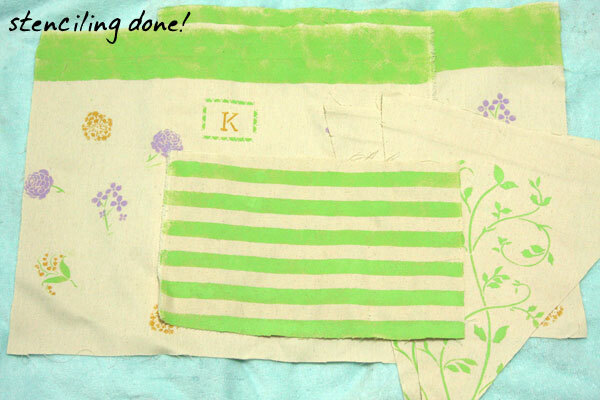 Fold the gussets in half lengthwise. 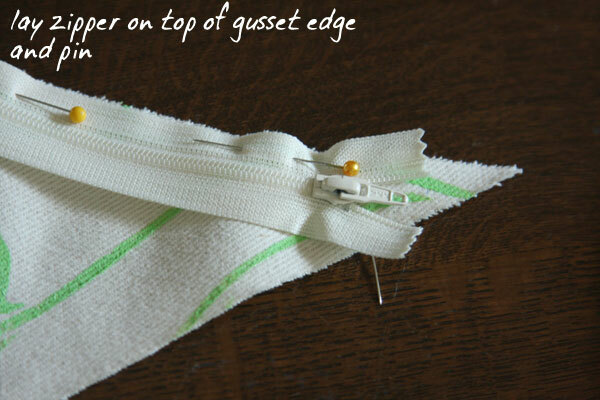 Attach the other side of the zipper tape to the other side of each gusset in the same manner (pinning first, tape on top of gusset, then stitching down). 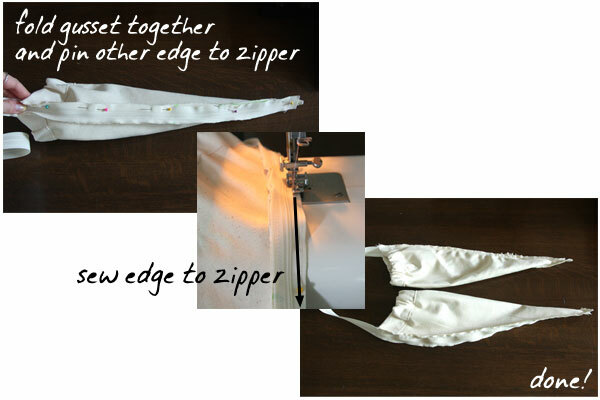 Now you have a long zipper with a folded triangle sewn to each end. 12. 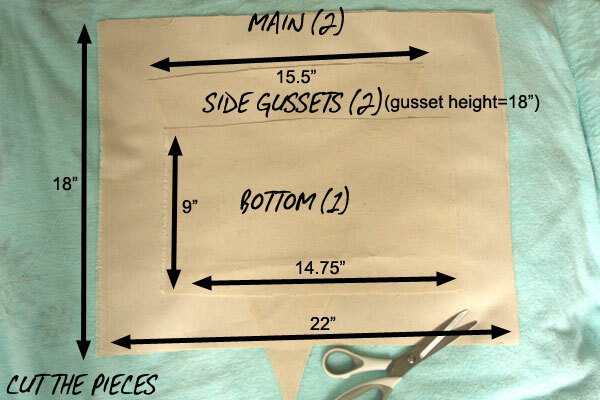 ATTACH THE SIDE GUSSETS TO THE MAIN PIECES: Place both MAIN pieces on either side of one GUSSET. Match the edges; pin right sides together. 13. Stitch the MAIN piece edge to the GUSSET edges using the zipper foot and following the line of stitching securing the gusset to the zipper tape. Now when the MAIN piece is flipped right side out, the zipper tape is caught in-between the MAIN piece and GUSSET, resulting in a clean edge. 14. 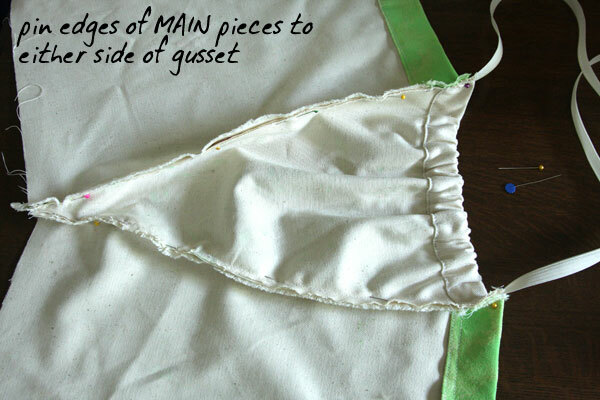 Repeat to secure the other MAIN piece to the remaining GUSSET edges. You now have a bag that’s connected at the sides but has a loose zipper at the top. We’ll fix that in the next step. 15. 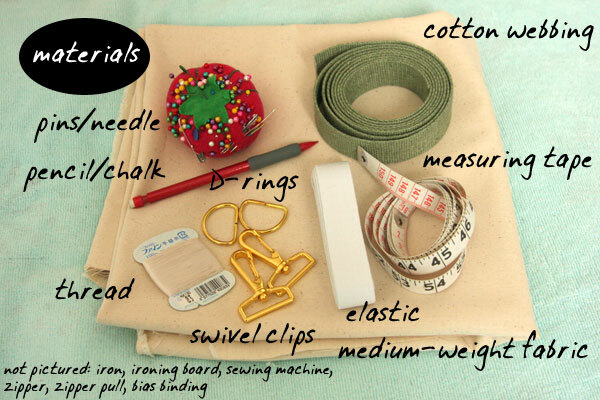 (Optional: Sew bias tape over the raw edges on the inside of your bag at this stage.) Also at this point: topstitch at each zipper tape edge, sewing on the fabric side to strengthen the seam. 17. Topstitch with the zipper foot to secure the zipper, all the way around the top edge of the MAIN part of the bag. 18. ATTACH THE BOTTOM: Position the long side of the BOTTOM rectangle piece in the center of the bottom of the MAIN piece, and pin. Sew. 20. Finally, secure the other edge of the BOTTOM. (Optional: Cover raw edges on the inside with bias tape.) 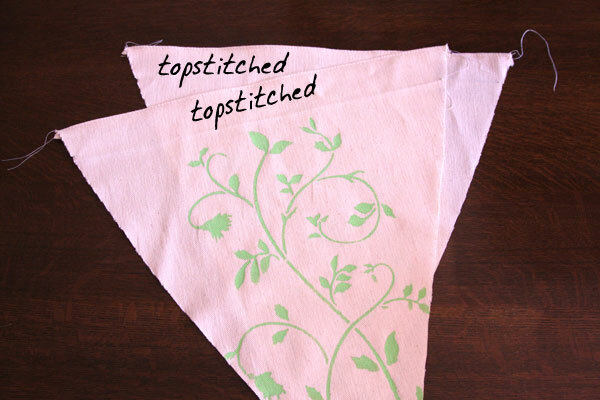 Also: for added strength, topstitch all seams around the BOTTOM piece as well. 21. 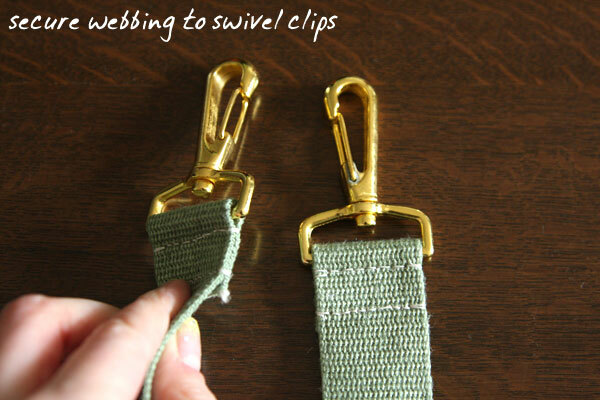 ATTACH THE STRAPS: Cut two small pieces of webbing about 5″ long or so. Wrap each around a D-ring and pin to one side of the MAIN pieces. 24. 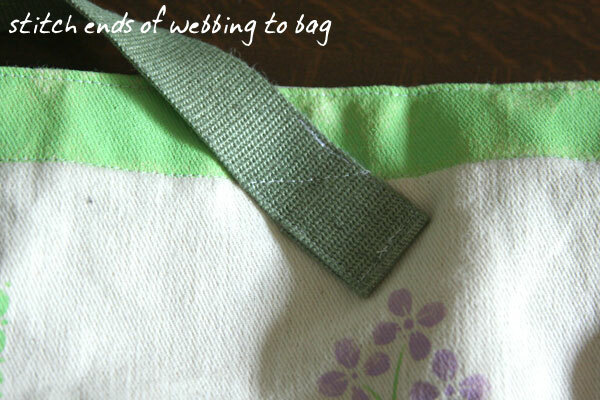 Secure each end of the webbing to the bag, spaced apart from where the D-rings are located. 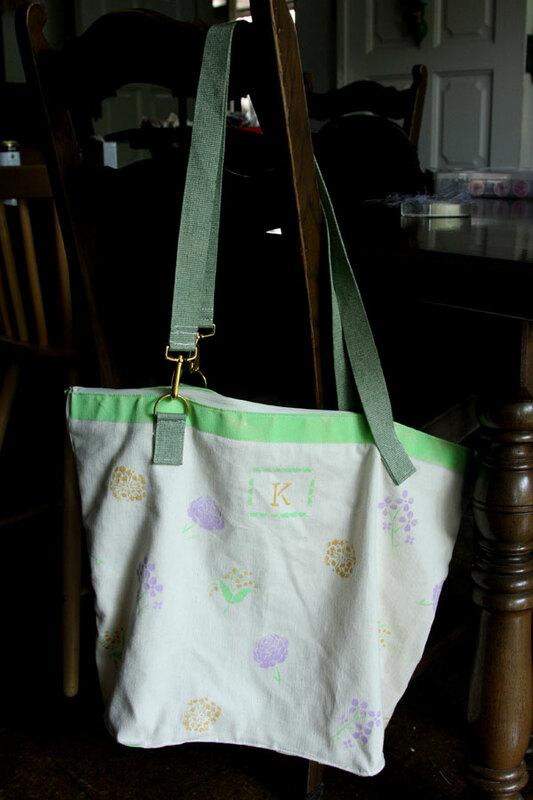 Since my bag is meant to be used as a backpack, I sewed the straps on at an angle; if you were just making a regular tote, then you would sew the straps on at a right-angle to the bag top edge. 25. (Optional) Add a decorative zipper pull/s if you like. And you’re done! Give yourself a pat on the back! 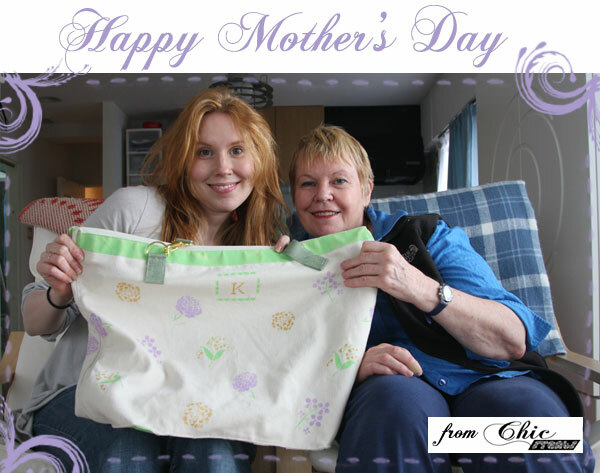 And then quick – wrap it up for Mom! Even though my mother will be getting her meals delivered for a little while after I’m gone, once she gets stronger she will definitely be able to use this at the market! 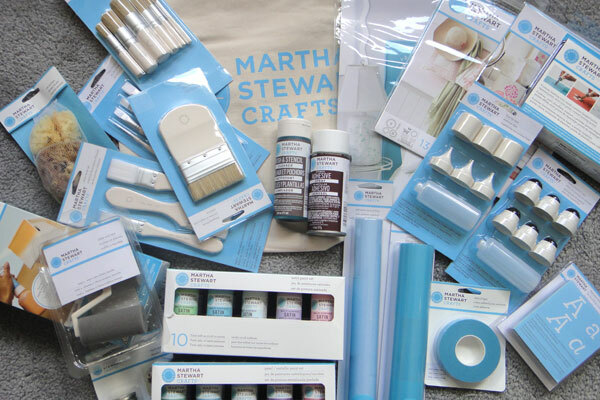 Thanks so much to Martha Stewart Crafts and PLAID for generously sponsoring this post! Happy Mother’s Day, Mom! And here’s to your swift recovery! FTC Disclosure: I wrote this post as part of a paid campaign with Plaid and Blueprint Social. The opinions in this post are my own. To read more about my Disclosure Policy, click here. omg.. i dont know how to say.. but you are amazing.. you think every detail for your mom.. thats really awesome.. im so proud of you.. great job.. This a great diy Carly!! So thoughtfull and well made!! Wishing your mum all the best! This is probably the first sponsored post that I leave a comment on! 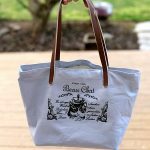 But this bag is very well built, very well designed, the tutorial is perfectly clear, it’s something unusual that you couldn’t find on the market and your mom really needs it! Happy mother’s day, Carly’s mom!!! Xox, d.
I really liked getting the story behind the “product”. But I couldn’t help to giggle a little about the “the customer does it herself”. Where I live (Sweden) we also pack our groceries ourselves. Actually, in most countries in Europe we do… Although now we have the system were one scan the item yourself during the shopping and put it in your bag immediately and then only pay at the front. I found ypur blog right around the time when you moved to help your mom and have been sending healing thoughts her way. It’s nice to read that she already is up on her cruches. I hope she continues to make fast recovery. Wow! First, I hope your mom continues on the road to recovery. 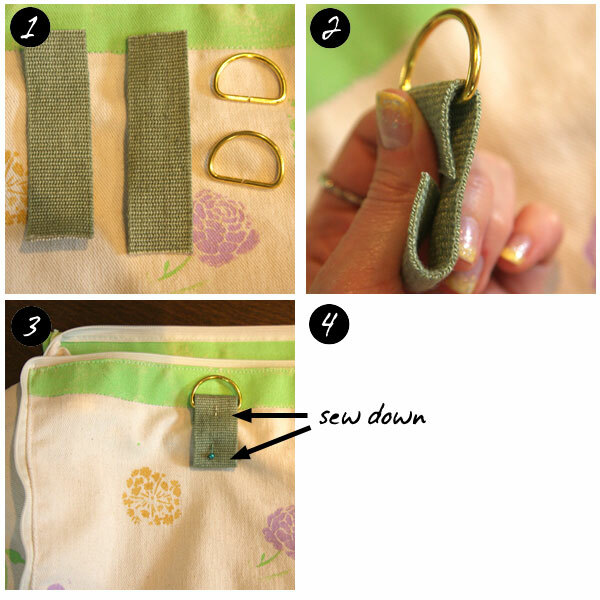 Second, what an awesome step-by-step tutorial for this darling bag! Well Done! Also, I love the pics of everyday Japan, I hope there are more to come! What a creative and practical idea! Love it! It turned out lovely and best wishes on recovery to your mom! you’re such a lovely girl to think through and make this for your mum. It’s love in action 🙂 Sending wishes for your mum to continue to make good progress in healing and getting stronger. 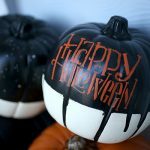 erin recently posted…are you joining the party? 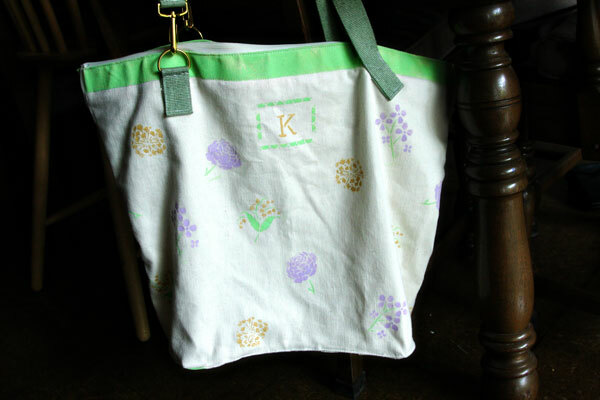 Yes everyone, the bag is wonderful, and so is my talented, creative daughter! Thank you so much Carly! I’m really looking forward to using this lovely gift at the market. Little did we know what all the time (when Carly was young) spent doing arts and crafts projects (largely from junk & recyclables) and making dolls’ clothes would lead to! Thank you all too, for your good wishes and encouragement. It’s really heart-warming and is very much appreciated!